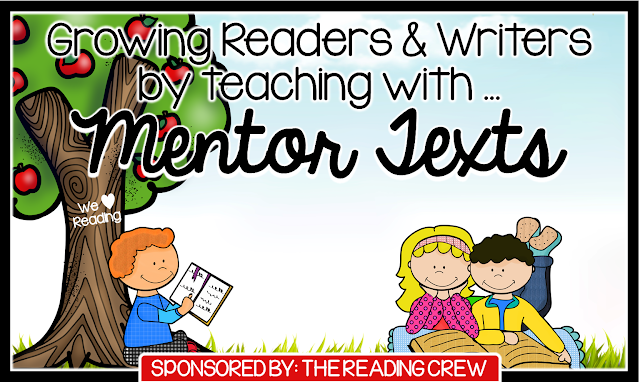 Hello and welcome to our Growing Readers and Writers with Mentor Texts Link Up and Giveaway! 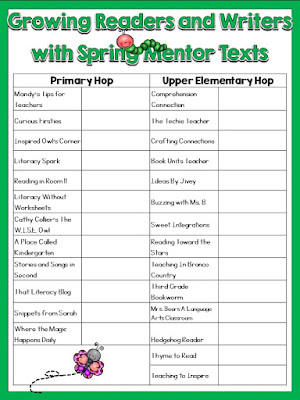 We are excited you are here, and hope you enjoy our spring book suggestions, lesson ideas, and freebies! We've definitely got you covered for spring! 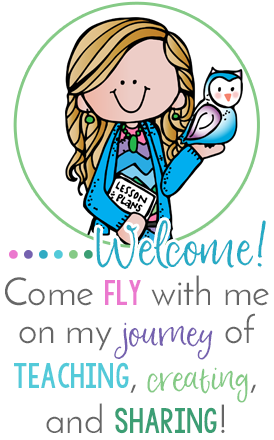 Be sure to visit the other bloggers participating in this link up. You will see everyone's blog located at the bottom of this post. There are K-2 and 3-6 resources. Be sure to save each blogger's secret word to enter our giveaway! 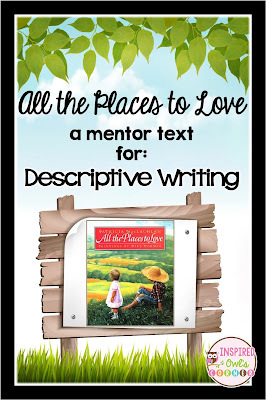 I choose All the Places to Love by Patricia MacLachlan as my mentor text. It is a beautiful story about a boy who lives with his parents and grandparents in the country. It opens with his birth, then continues to poetically detail the special places around his home that he and each member of his family love most, ending with the birth of his baby sister. I first read it to my class about 12 years ago. I had just returned to the classroom after taking a year off following the birth of my second child. I hadn't previewed the book before reading it to my students, only heard it was amazing from our school librarian. The words were so beautifully written and poetic. I was missing my girls so much, that by the time I was finished reading the story, I was a sobbing mess! When I read it to my class every year, they are moved. Boys and girls will murmur "Awww... that's so sweet!" aloud at the particularly moving moments in the story. I tell them that's precisely why I love this book! There are actually many reasons, but the one I want them to ensure they leave with is understanding the power of words. Even in a short picture book, words can move us. I also tell them to borrow what they learn from this mentor text and practice using powerful, descriptive language in their own writing. 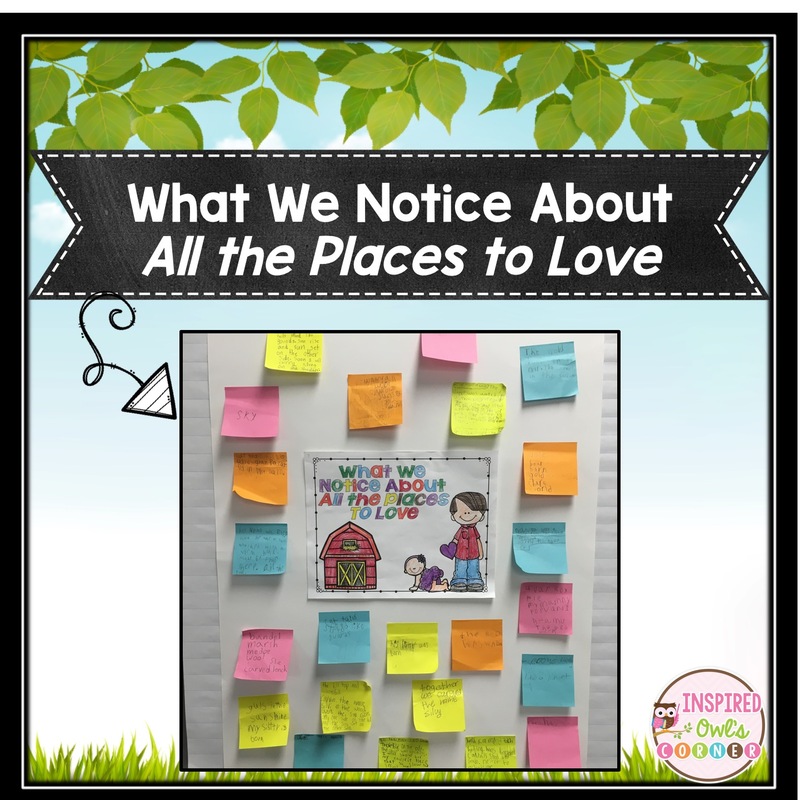 Before reading All the Places to Love aloud to my students, I pass out a few sticky notes to them. I ask the students to write anything that appeals to them or anything they notice about the story on their sticky notes. They can write memorable language, a connection they have, or anything else relating to the story. When I'm finished reading, I ask each of them to bring up their sticky notes and post them around the poster I have ready for them. We discuss what they wrote on their notes, and I point out the sensory language, similes, metaphors, personification, compound words, and vocabulary as we are discussing their findings. 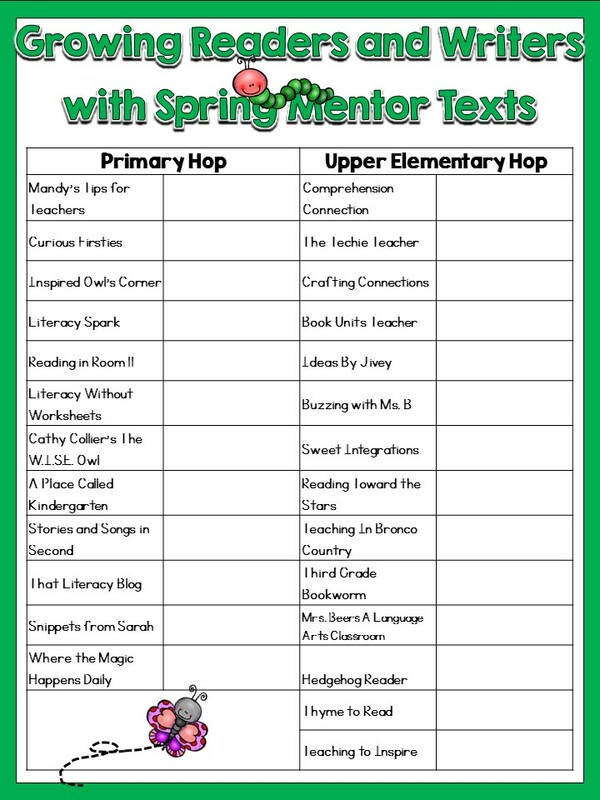 (There are so many teachable moments with this mentor text!) I let the students' observations drive our discussion. Next, I have the students take out their Writing Notebooks. 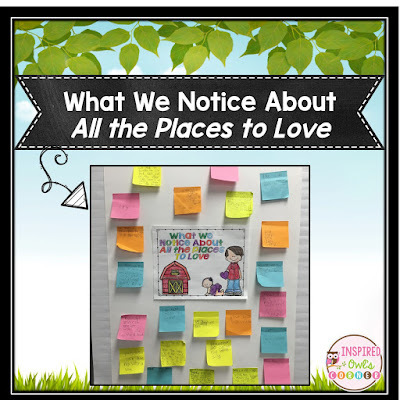 As a class, we brainstorm and discuss some of their favorite places. 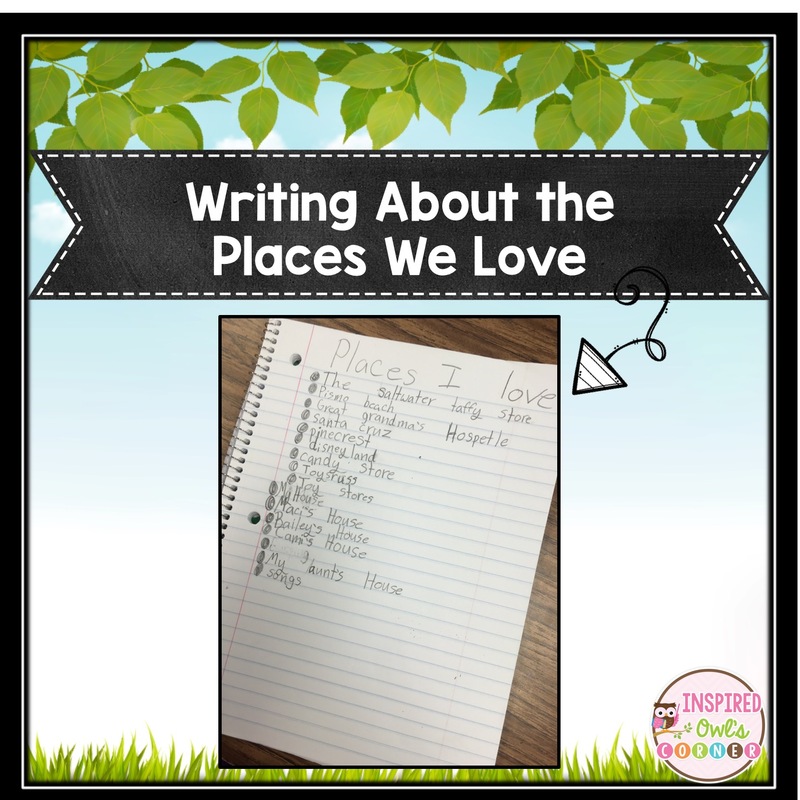 Then I ask students to make a list of the places they love. They always want to begin writing details about their favorite places, but I tell them this is just a list to get ideas to write about. After about ten minutes, I ask them to circle the one that is their favorite. Sometimes it's difficult for students to narrow it down to just one place, but I tell them they can write about their other favorite places another time. After students have narrowed down their list to one favorite place, I give them the a Describing My Favorite Place organizer. 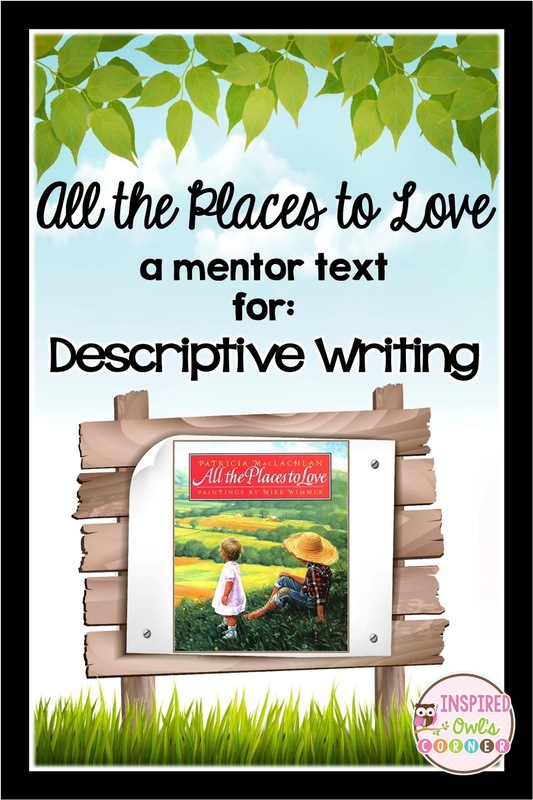 We review the author's use of sensory details, and I encourage students to write down all of the sensory details they can think of that relate to their favorite places. When they are finished with that, I give them a second organizer to document memories of their favorite place. These two organizers help get them ready to write the rough drafts of their descriptive pieces. 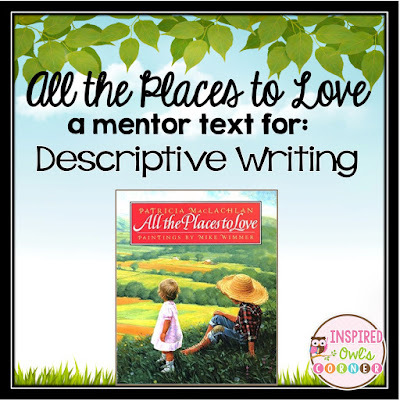 As an extension, students write a descriptive piece about their favorite place using their graphic organizers to refer to as they write. We go through all of the steps of the writing process, and students complete their final drafts on the writing papers I include in the freebie file. 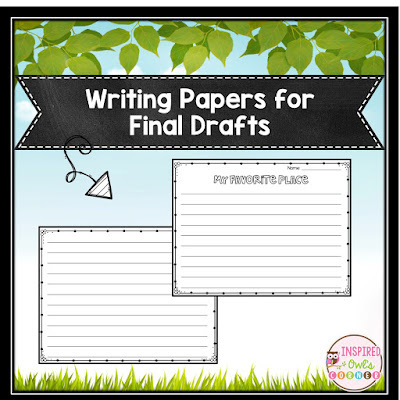 You can click on the picture below to grab your freebie! I hope you find this story as wonderful as I have over the years! 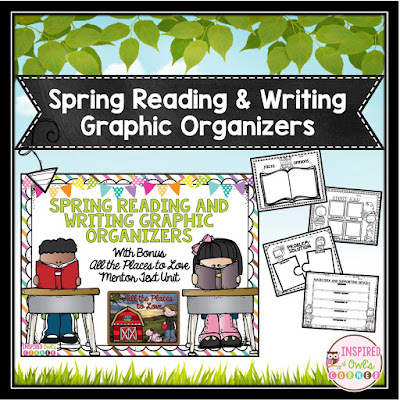 This freebie file is part of a larger file that includes spring themed reading and writing graphic organizers that can be used with any picture book and a bonus unit for All the Places to Love with additional activities. You can click on the images below to see this file. Click on the image below to download and keep track of each blogger's mystery word. My mystery word is meadow. Thank you so much for stopping by, and good luck! Thanks so much for the freebie!! It it wonderful!! I am really excited to check out this book (I hope to next week!) It seems like a great way to start the year for writer's workshop when we describe places we love. Thanks so much for the ideas! What an excellent post! Thank you for joining in with us. You do such a great job with your images, BTW! I love this book and appreciate the additional ideas. Great post! I have never read this book and now I cannot wait to try it with my firsties!! After reading your post, I look forward to getting this book. Thanks for sharing your ideas.